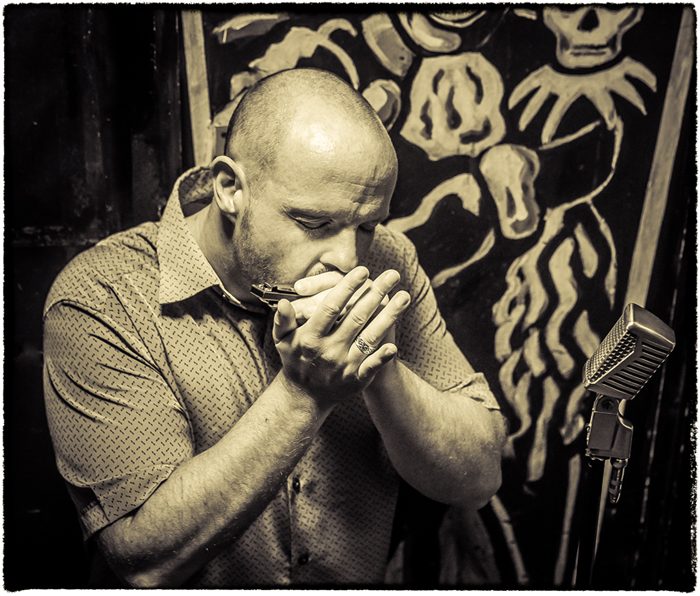 Out of such a small instrument, his harmonica in hand; JD front man of the band, delivers a waling, “big-tone”, amplified urban Blues sound, reminiscent of Little Walter and Big Walter Horton, or a lazy, soulful sound, in the spirit of Louisiana “swamp” Blues. A sincere and deep kind of Blues one may hear on an old “Chess” or “Excello” record. This Blues outfit will take you on a ride through the Blues heritage of 1950’s America with a repertoire of Chicago Blues, Texas, Louisiana and Mississippi “Hill Country Blues”… Jimmy Reed, Muddy Waters, Little Walter, RL Burnside, Slim Harpo and many more.